WENDELL, North Carolina (WTVD) -- People driving past East Wake High School in Wendell last Wednesday night might've thought there was a big athletic event going on. Or a PTA meeting. Or perhaps a school talent show. The scores of cars in the parking lot -- representing hundreds of people -- were the result of a religious gathering. "It was just a moving experience," said 17-year-old Caroline Bell. "You could really feel the Holy Spirit in that room." Bell, an East Wake senior, was one of the local student organizers of "Fields of Faith," an annual outreach of Fellowship of Christian Athletes. In fact, Fields of Faith events were taking place across the country. "It's a night of student testimony," said Jay Veverka, Area Director for FCA. "Plus, Scripture reading and an invitation for the community to come together and hear how God has worked in the lives of student-athletes across their area,"
Veverka says about 500 people attended the East Wake gathering that night, representing 10-15 high schools and middle schools in Wake County. Among the students there was Caroline Bell, who says helping to organize the gathering was a labor of love. "It was important for me because I knew that this day could potentially impact someone's eternity. And if they were moved by the event at all, that might change the way they lived their life. They might want to start living for Christ." 17-year-old Josh Allmon, who served as emcee, says teens can make a big difference when they share their faith -- even if they don't realize it. "As kids we don't recognize the platform we have and the potential that we have to spread the word," he told me. "So I think that's something more people should take advantage of. 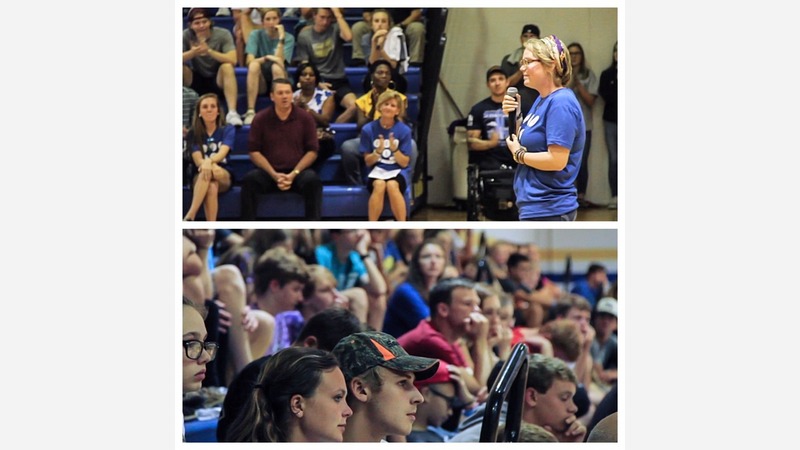 Hopefully, something like Fields of Faith was able to show people that this group of high schoolers can have a huge impact." The East Wake Fields of Faith event took place in the school's gym instead of the football stadium due to the threat of rain. But the FCA's Veverka says that didn't dampen the mood. "What we're seeing on our campuses is really incredible. We're seeing students that love Christ and want to genuinely live out their faith on their campus, and they want to share that with their peers. And Fields of Faith is a way in which they as students can communicate what God is doing in their life and how God's word has changed their life. We are very intentional to have the students take the lead role that they do."